The Shure SM57 is my desert island microphone. No, it’s not the most glamorous mic in the world but it’s one that will always get the job done if you know what you’re doing. In the pro world it’s still the standard for snare drums and guitar cabs. Even though there are most definitely better choices on many sources, I’ve never found one where I wasn’t able to get at a sound that was at least usable when I was using a SM57. They are also virtually indestructible. I’ve always encouraged my clients to get themselves a small demo/home recording rig (I’ll get into this soon in an upcoming blog post) and I almost always recommend the same starter setup: a small interface, a pair of decent headphones and a decent mic – a Shure SM57 or SM58 (would ya look at that: all of a sudden you also have a world class mic for live use too!). Upon suggesting this almost all clients come back to me with a suggestion from whatever music store they’re buying from to get some cheap Chinese condenser mic. “It’s a condenser so it must be better than the SM57, which is just a dynamic, right?” ALL THE FACEPALMS! I also fell into that trap when I started out. See, the vast majority of those mics are quite bright, which sounds really impressive to inexperienced ears, but will bite you in the a$$. I found myself constantly fighting that brightness, which turned quite harsh and spitty once I started “working” the mix. The SM57 will teach you how to record. It will teach you how to use it properly, from which you’ll learn much more about capturing sound than any bright mic will ever teach you. So, when trying to steer folks in the right direction with that first purchase, my view has always been “if you can’t get it to sound decent with a 57, it ain’t the mic’s fault”. With all of this in mind I wanted to put my money where my big ol’ mouth is and prove that, with the necessary skills, you could produce a pro sounding track using just these amazing mics. I had 3 SM57’s and 2 SM58’s to use for this experiment. Shure themselves say they’re close enough to each other and, besides, 57’s and 58’s are what most musicians already have available to them. I used my Ludwig birch kit with a Ludwig Black Magic brass snare. 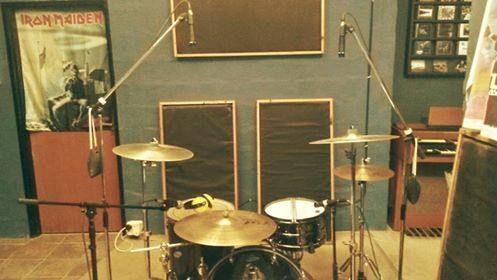 Since I had only 5 mics to use, I setup the kit with only a floor tom. Because the SM58 as a small touch more bottom end because of the grille design (again, this is according to Shure themselves) I opted to use them on the kick and floor tom. The kick and snare went into my pair of Neve 1073 channel strips. Both kick and snare got about 3dB boost at 12KHz and the kick also got a bit of love at 110Hz. Both were compressed (+/- 6dB of gain reduction) on the way in. The tom went through a channel strip on my beloved console, where we added a touch of bottom end and a bit of top end EQ-wise. The overheads just had a small touch of compression (+/-2dB of gain reduction) on the way in. I also took samples of the kick and snare after we tracked the song and augmented (not replaced) the kick and snare tracks with them. My assistant/session drummer, Christian Burgess, did a great job of the drumming but we both quite liked what the samples added to the mix when we augmented the live drums with them. I used 2 different acoustics for different parts and textures in the song: an old Epiphone mahogany/spruce dreadnought and a Cort rosewood/spruce cutaway dreadnought. I added a touch of top end EQ and a touch of compression (various amounts on different parts) on the way in. I really like playing with different textures in my productions so I mostly used my 2 custom built Les Pauls into my Marshall JMP Super Bass and Marshall JCM800 2203 heads. One clean part was tracked with my ’66 Fender Super Reverb. The heads went into 2 custom built cabs that I’ve loaded with different Celestion speakers that I can blend as needed. I have a nice isolated booth so I can really crank these amps to do what they do best. I don’t have a dedicated bass cab so I just used my guitar cabs. I also used quite a bit of compression (up to 10dB of gain reduction) on the way in, as I always do. It’s been years since I last tracked my own singing so go easy on me. 😛 I actually like the SM57 more on studio vocals than the 58 as I find it to be slightly more open sounding. I like to track vocals like this with a good bit of compression (up to 15dB on the most aggressive parts) and I also added some top end EQ from the Neve. It was SO much fun tracking one of my own songs again, since I haven’t done that in years, that I’ve decided to do more songs in the near future. I always believe in getting things right at the source and it was extremely exciting to see all of this come together during tracking, knowing that we had good sounds to work with during the mix. In the next installment I’ll discuss how I mixed this track using mostly stock Cubase plugins.